Slightly over a year ago our laboratory already published a review dedicated to AquaInspector hardware and software system. One of its advantages was easy installation. 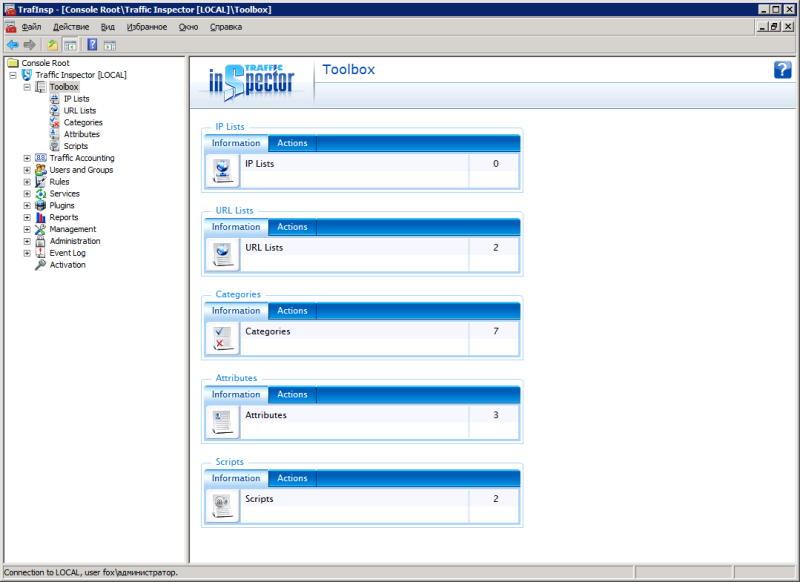 AquaInspector comes completely pre-installed and pre-set so that the administrator doesn't need to carry out any complex getting-ready and software installation or setting up procedures to start using the device. However, due to a number of reasons AquaInspector hardware platform made it impossible to use the device in large networks. In 2013 Smart-Soft company launched a renewed AquaInspector product line that does not have bottlenecks which were present in the older version. This or that way, there are still certain things we were surprised at, but let's review stuff in the right order. This review will not feature issues associated with the web-portal operation or any server support procedures, but will mainly focus on performance of the device. 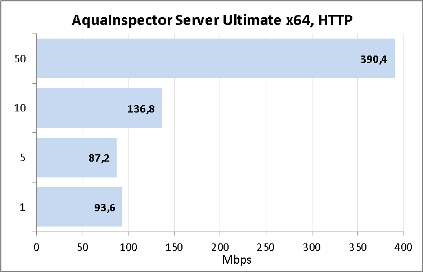 AquaInspector Server 2013 product line includes two desktop servers (AquaInspector 2013 Server Foundation and AquaInspector 2013 Server Foundation) and one rack-mounted model (AquaInspector Server Ultimate). It is the rack-mounted model that we have been provided with for review. The server case has dimensions of 656x444x43 mm. Rack mounting is performed using special-purpose railings that are included in the box. Upper, bottom, and side panels are not remarkable at all. On the front panel there are four HDD bays; one of them had a 500 GB Seagate ST500ST500DM002 data carrier inside. Presence of the only pre-installed data carrier means that there is no possibility to backup data on the disc from inside of the bay. In other words, the device allows one to install extra discs and create a RAID array, but the vendor has not implemented it and the administrator will need to get dealt with it him/herself. We think that is a pretty weird approach, especially considering the application area of the device under review. The front panel also has a DVD drive and two USB 2.0 slots located on it. Apart from it, there are also several buttons and LEDs located over here. In the end, we could not find a detailed description of T40 S15R server neither on the software developer's website nor on the server vendor's website. Fortunately, the model under review is powered by standard ASUS RS300-E7/RS4 platform. Actually, we would like to advise administrators to visit ASUS website in order to obtain any other additional information about the device, which is especially relevant to issues on the HDD types supported. LEDs on the front panel indicate the device and its disc sub-system statuses, utilisation ofthe network interfaces, and presence of any additional messages. In addition to it, Location button and LED allow one to identify this or that server in case if there are several of them available at the same place. By using two other buttons located on the front panel the administrator can switch off or reboot the server. On the rear panel of the device there are two detachable Delta Electronics DPS-400AB-10 D power supply units with the maximum unit power efficiency of 450W. The rear panel also has two PS/2 slots for connection of a keyboard and mouse, two USB 2.0 ports, one VGA slot, five network interfaces (four common Gigabit Ethernet ones and one used for connection to the KVM), and two slots for installation of additional expansion cards. In case if existing ports are not enough, the administrator may install supplementary network cards as expansion cards. The vendor recommends installing such NICs as Intel and 3COM or any other ones that partially tackle initial computations themselves without passing it over to the CPU. 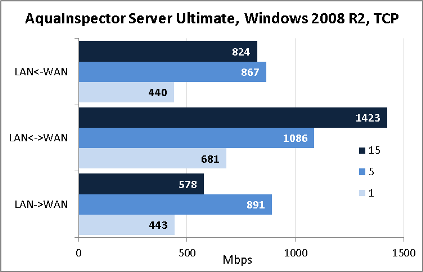 Installation of Realtek NICs may result into a decline in server performance upon heavy load. It would be fair to point out that the throughput capacity of four existing physical interfaces is way enough for putting all server capabilities into practise, whilst a need for more interfaces may be met by using managed switches with 802.1p/802.1q support. Now let's have a look at the server insides. Its electronic stuffing is mainly located on three green textolite cards. 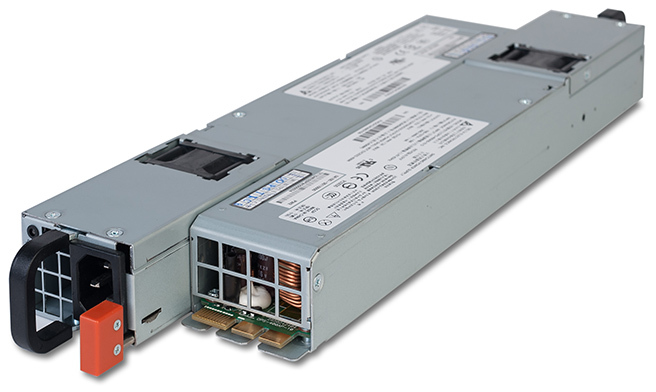 ASUS PDB-10E secures switching of the power supply between the main and standby PSUs. 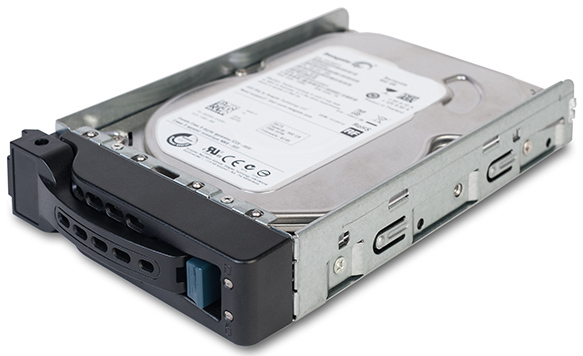 HDDs are connected to ASUS BP4LX-R10A card. ASUS P8B-E/4L functions as the motherboard, and almost all conducting lines to this chip are glued over. Four Intel 82574L adapters are charged with network support functions. 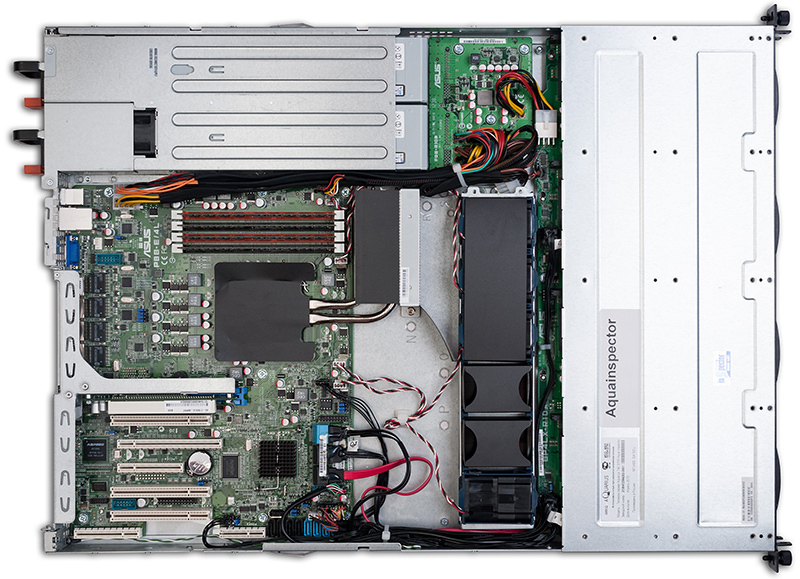 The system is fitted with 16 Mbytes of video memory powered by Aspeed AST2050 chip. 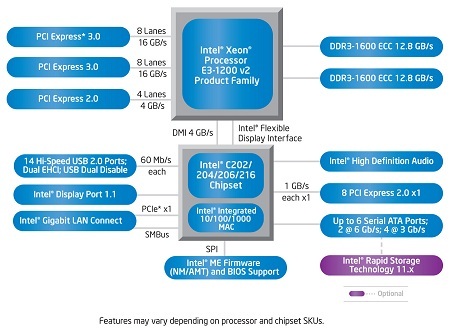 Intel C204, whose flow chart you can find below, secures operation with HDDs. Other small cards perform support functions: moving the PCI-E slot over for a more comfortable installation of expansion cards and securing output of service information onto the front panel LEDs. We believe that we should say a few words about the cooling system, too. All in all, there are six 40x40 mm fans inside of the case: two of them are located in the PSUs and other four are inside of the case. 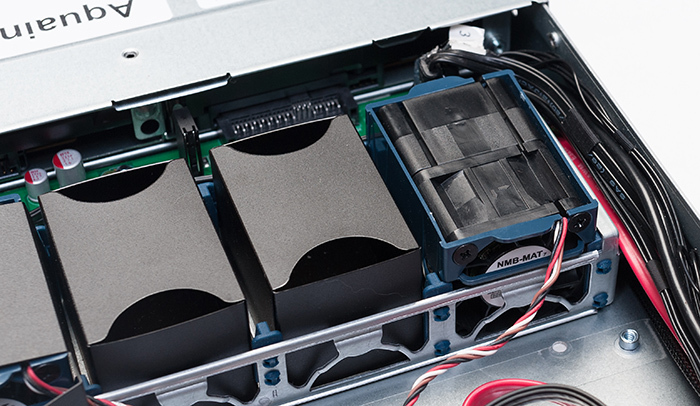 The case fans aren't permanently fastened to the railings, but loosely put into the rubber-coated mounting seats, which is meant for reducing noise made by the server. However, not all fans are installed in the device. There are six mounting seats for case fans, meanwhile only four Minebea Motor 1611FB-04W-B66 are actually installed. Tree of them are engaged in cooling of the CPU that does not have any other cooling. Two unused mounting seats for fans are covered with special-purpose blinds. One can also install double fans into these mounting fan seats. The server possesses four 4 Gbytes Kingston KVR1333D3E9S/4G DDR3 RAM modules, making the total system RAM size 16 Gbytes. 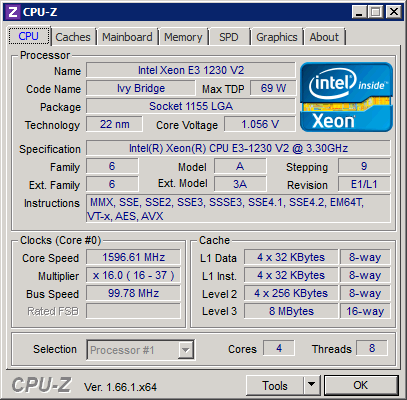 The CPU functions are performed by Intel Xeon E3 1230 V2. Among several new builds of Traffic Inspector solution that Smart-Soft company launched following our last review is release 3.0, which primary new features are numbered below. It was namely Traffic Inspector 3.0 we used to perform testing procedures. We would also like to point out that the developers are planning to launch a 64 bit software version, which is still under in-company beta testing. We requested the vendor to provide us with this version in order to perform benchmark tests with its 32 bit counterpart. It's also worth noticing that 2.0.1.731 release now has features of blocking and automatic refreshing of the prohibited Internet resource lists (zapret-info.gov.ru is available only in Russian version of Traffic Inspector). Apart from the above mentioned list Traffic Inspector also has a number of other lists which it uses to identify this or that website. If it's necessary, the administrator will be able to review the list of search queries that one used in this or that search engine (Traffic Accounting-User Monitor-Search Queries). However, it stands to mention that the search queries used in search engines through HTTPS are not included in the statistics. This way, for example, our Google search queries weren't displayed. Another new function is a deep u32 analysis of transmitted packets. 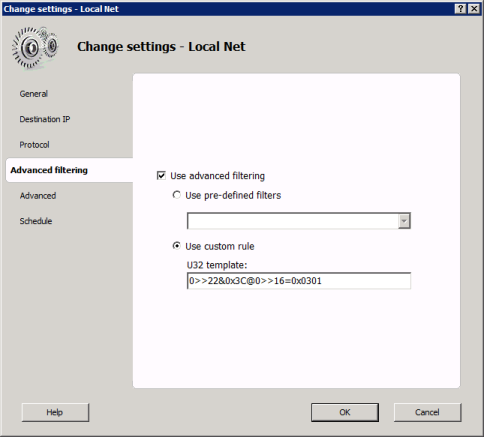 To use it one needs to access User Rules sub-item in Rules menu item and either choose one of the existing rules or create a new one and enter Advanced filtering tab in its settings. As of when the article was being written, the rules pre-set by the vendor were not available. These will be working in later Traffic Inspector versions, while currently administrators can create u32 filters themselves. We couldn't thelp but mention GWShell utility which gets loaded automatically upon authentication of a local or remote user. 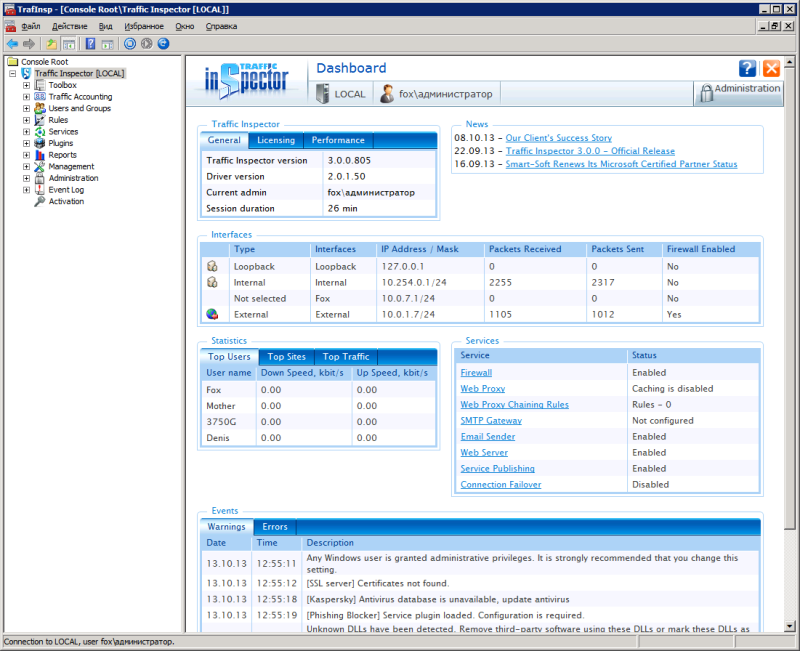 One can perform a number of frequently used activities via this utility. Upon authentication through the web portal the administrators will be able to review the list of activity of their own or other administrators; to do that one needs to access Administration-Diagnostics-Admin Report sub-item. For example, information on assigning or terminating administrator rights and data on administrators' password changes are stored over here. If one needs to track user billing activity, s/he will need to use Administration-Reports-Billing menu sub-item in the web-portal interface or Reports-Billing menu item in the admin console. That's where we proceed to completion of the brief review of the web-interface capabilities and pass directly on to testing. The first procedure we usually begin our testing section with is estimating the booting time of the device, which is a time interval starting with the moment when the power is on until the first echo reply is received through ICMP. 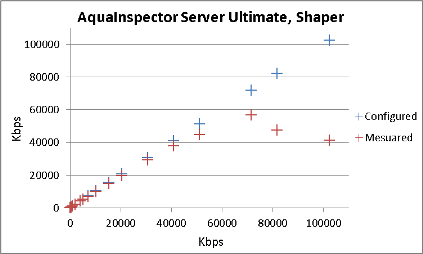 AquaInspector Server Ultimate boots in 45 seconds and we believe that this result is decent. Since all following tests will be associated with the throughput capacity, we decided to provide a table with the key characteristics of our test stand now. Generally, we carried out the testing procedures using Traffic Inspector 3.0.0.804 on the platform of Microsoft Windows Server 2008 R2. 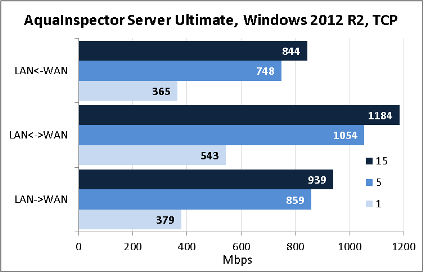 Since really soon AquaInspector will be updated to Windows Server 2012, the system throughput tests upon operation with common TCP traffic feature results for two operating systems. 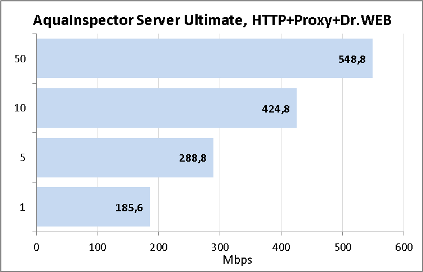 We used JPERF utility, 2.0.2 version, to generate TCP traffic. As of when the article was being written, only Traffic Inspector x32 was available for use, whilst its x64 counterpart was still under beta testing. 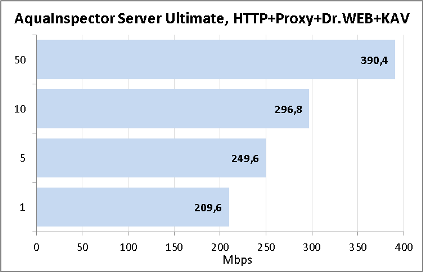 We requested the vendor to provide us with x64 version too so that we could test throughput of the two upon processing of HTTP traffic. 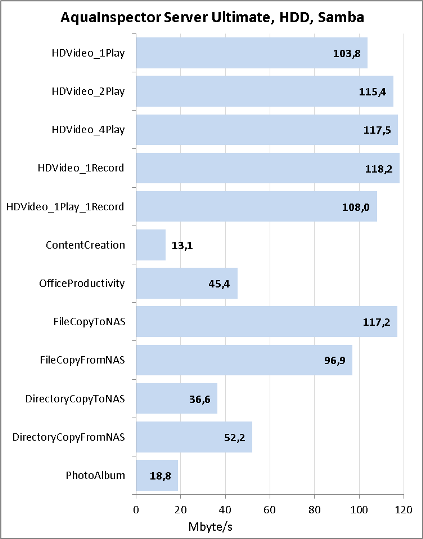 The measurements were made using 2.2.25 HTTP Apache server and download manager for 1, 5, 10, and 15 concurrent data flows. Results of the measurements are presented on the diagrams below. As the vendor claims, x64 Traffic Inspector version will perform the best if functioning within heavy-loaded systems with a large number of users. 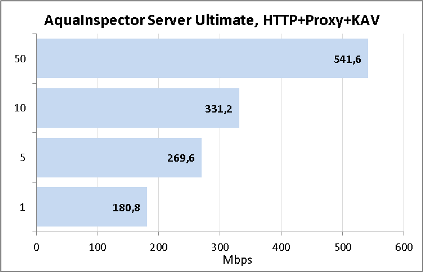 Since Traffic Inspector software can also act as a proxy-server, we decided to check what the maximum HTTP traffic transmission speed is if using proxy. The traffic transmitted can be checked for viruses using the following modules: Kaspersky Gate Antivirus for Traffic Inspector andDr. Web Gateway Security Suit for Traffic Inspector. 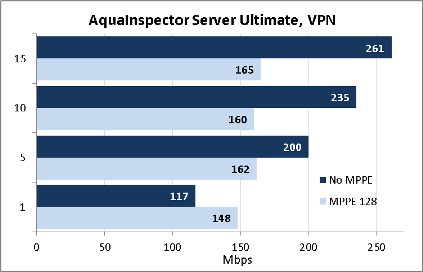 Also, AquaInspector hardware and software system can help the user count the traffic transmitted via VPN, which has been set up using RRAS service. Connections like these are frequently used by providers in ex-Soviet bloc countries for authentication purposes. 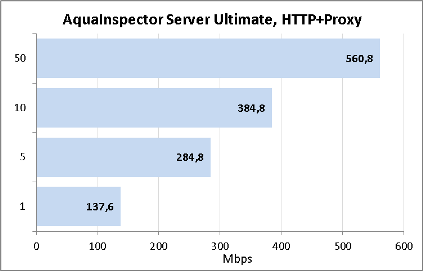 The graphs presented below show the performance of the device under review upon processing of TCP data flows transmitted through encrypted and non-encrypted connections. When creating a billing plan, one can set limitations on the highest data transmission speed in both directions. We decided to test how exactly the set and real speeds correspond. It turned out that these limitations would be reasonable to use only with the service plans of 60 Mbps or less. And probably the last thing that we'd like to review is the access speed—using Samba protocol—to the data located on the server HDD. In order to test it we used Intel NASPT utility, version 1.7.1. 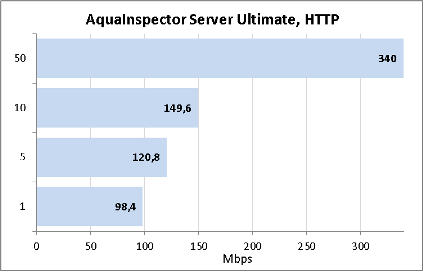 Generally, we are quite glad about the tool for organisation, control, and protection of the Internet access, AquaInspector Server Ultimate, we tested: it's a 1U rack-mounted server with two PSUs which shows a much higher performance level than its predecessors from 2012. Presence of two power supply units is another big step toward entering into the corporate segment; however, we believe that these two things are not yet enough in order to calcify the company's position in the market and become a fully-formed device. There are two things we were surprised at: hot backup of the entire device and IPv6 support are unavailable. We were also a bit dazzled because just one HDD was installed inside of the case. We believe that the new product line of the hardware and software systems will not have any of these shortcomings. A pre-installed IPMI module will be a useful feature, too. As of when the article was being written, one could purchase AquaInspector Server Ultimate for 199,000 roubles for a basic modification and 229,000 roubles for an FSTEC compliant version. 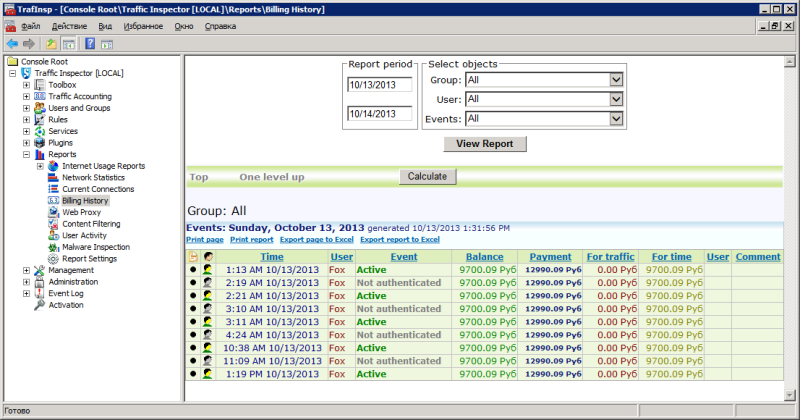 The server and licensed server OS and unlimited Traffic Inspector software versions are included in the price. Extra add-on modules may be purchased separately and are not included in the box.